So I got my RTM edition of Windows 8 downloaded and installed from TechNet this week. Everybody at work was excited, but I think I was the only one who stayed up late and installed it as soon as I could! And of course, now that it’s Friday, it’s time for a gaming post. Obligatory though it may be, I’m excited to bring some cool notes your way. That’s right this is Gaming in Windows 8 – Part 2. Starting with Microsoft’s version of Mahjobng, above, it’s easy to see that the game has some deep Xbox Live integration on the way. Leaderboards, statistics, Achievements, and… medals? It says “Awards” underneath, and we’re familiar with Avatar Awards and Achievements, but what in the world are medals? Upon finishing my first round, it told me I had unlocked an award – it was the next tier of the game boards. No details about medals. So on to Minesweeper I went. 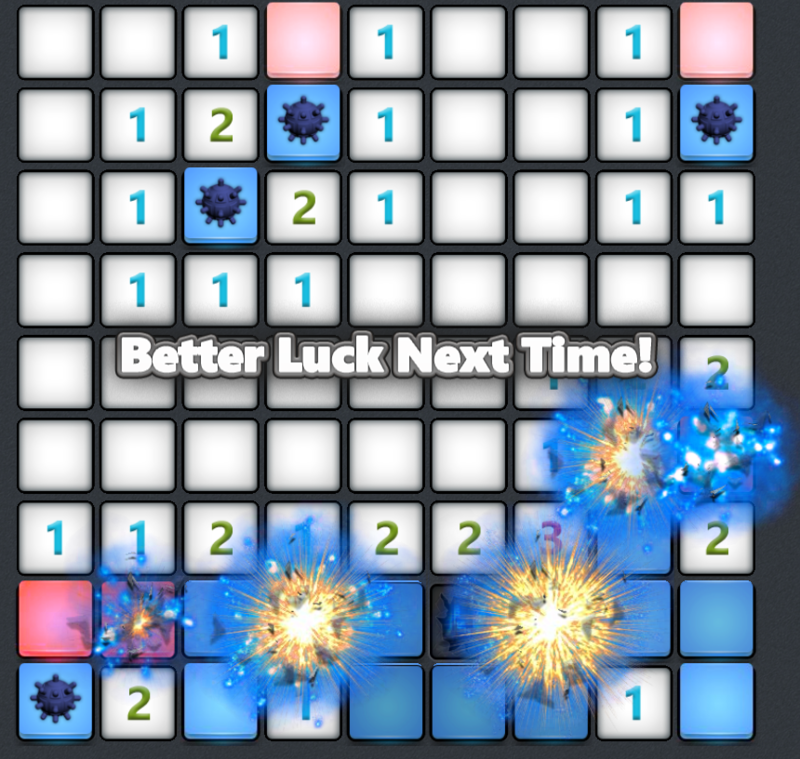 Prettier amd more modern looking than the Windows Phone 7 counterpart, Minesweeper for Windows 8 still holds true to the traditional play style. A few minor achievements are available, and we have more mentions of medals, but I march onward for a better understanding. 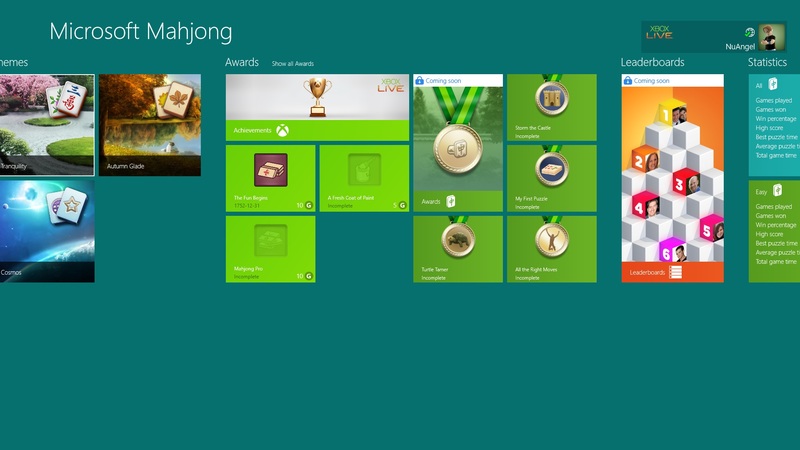 Microsoft Solitaire Collection for Windows 8 isn’t just a solitaire card game, it’s five of them. Including Klondike, Free Cell, Spider, Pyramid, and TriPeaks. If you don’t know what each of them are (and I certainly didn’t), you can scroll to the far right of the main menu and learn how to play each one. In the menu, of course, are also options for changing themes of your table and cards, a “coming soon” feature that says “Create a New Theme” (which most likely just means import a picture), more daily challenges, leaderboards, achievements and medals – but we still have no clear definition of what medals will be or how you will be displaying them to your friends. This is something I hope I don’t see much of: being prompted like this to enter the Marketplace to download the updates for the game. I completely understand the need for updates – and users who haven’t manually updated they should be required, much like Xbox Live’s Title Updates, I think these should be automatic; perhaps they will be automatic, closer to official “Launch Day” October 26th, 2012. Windows Phone 7 has easy Marketplace App updating all in one place, which I think will be the ideal method to accomplish these updates in Windows 8, but these strange pop ups, appearing after I’ve already entered the game, as you see above, make me think they may be going for more of an “expansion pack” or DLC feel, where it’s going to take me to something other than the app I’m already in, and it won’t just be an update, it’ll be a paid expansion. Here’s hoping not everything in Windows 8 becomes a giant advertisement. You already have to stare at them on the right hand side of Wordament the whole time you’re playing! Just got my Windows 8 RTM installed!